Miele Capri Vacuum Review – Which Floors Is It Best For? 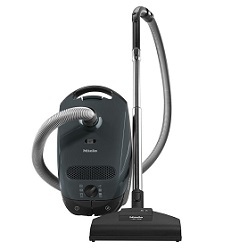 The Miele Capri is one of their C1 Classic vacuums that is lighter in weight but can still handle most floors. Like their other canister models it has a variety of features that let you clean just about anything in your home. It is also designed and tested to be used for many years of typical cleaning. In fact, they put it through the equivalent of 20 years of use just to make sure it will hold up. The construction happens in Miele owned plants where they provide quality inspections at various points in the assembly process. The end result is a vacuum cleaner that is built to last. The Capri (former S2121) comes with two different full sized attachments, each designed specifically for different types of flooring. The Turbo Comfort Brush has a rotating brushroll that helps stir up embedded dirt from carpet fibers. This attachment is not electrically powered like the Electrobrush tools on the larger models (only powered by air suction) so it isn’t ideal for thick or high pile carpets. It does, however, work well on low to medium pile carpeting. The Parquet hard floor tool has soft natural bristles that can clean the surface well without damaging it. They glide smoothly over the floor to help get any dirt or dust moving so the powerful suction can quickly pull it up. This is especially important on hardwood or laminate where you don’t want to leave scuffs or scratches in the finish. At 12 inches wide it also provides adequate coverage so you will make fewer passes than when using the smaller attachments found on cheaper canister vacuums. AirClean™ filtration system is tested to remove 99.9% of the smallest allergens like dust mites, mold spores, and even pet dander from the air as it passes through the machine. These organisms can cause reactions especially in those who suffer from asthma or allergies, so it is important to find a vacuum that is rated to remove them. Miele’s AirClean consists of three components that work together: their HyClean™ dustbag, a motor protection filter, and an exhaust filter. The Capri doesn’t usually come standard with a HEPA filter but it can be purchased extra. A tightly sealed housing means no dirt or dust particles can escape out, even when you are emptying the bag. The head attachments also are designed to seal correctly with the floor to optimize the airflow and improve suction. They design their canister vacuums this way so they can provide the most power while using less electricity. Higher wattage doesn’t necessarily mean better performance. The stainless steel telescoping wand can be height adjusted by pushing a button which is a big time saver. It is much more durable than the cheaper plastic wands found on less expensive vacuum cleaners as well. 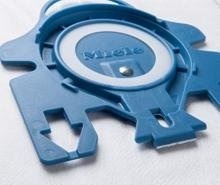 The wand is a key component of a canister which is why Miele put some thought into the design. From changing attachments to altering the length, you will come to appreciate how easy it is to use. Easy to use controls like the rotary dial power selector and fingertip controls let you change the settings with very little effort. You can set the power to full for thicker carpets and then dial it way back for using the Parquet hard floor brush. Having controls like this is almost an afterthought but it is a feature you will definitely notice if it is missing. If you are constantly bending down and manually changing power settings like you would on the cheap brands, you will soon realize why a high-end vacuum like a Miele is worth it. They are a company that is deeply involved in the cleaning industry and spends a lot of time on research and development each year. An ultra lightweight design of 13 pounds will save your arms and back during prolonged use. The entire C1 lineup is especially easy to carry around, even up multiple flights of stairs. You will be surprised how light it is once you spend any time vacuuming with it. The large rubber wheels also roll nicely over any type of surface and they easily spin in 360 degrees, letting you pivot around tables and furniture without much effort. Just another well thought out feature that is much appreciated, and one you will likely start to take for granted after a few sessions. What Floors Is It Designed For? The Miele Capri works best on hard floors like tile, laminate, linoleum, and hardwood as well as low to medium pile carpets. It just doesn’t have the electric powered turbo brush like their larger canisters like the C3 Soft Carpet or even the SEBO AIRBELT D. Those vacuums have the power and attachments to handle thicker carpeting, but that is not where the C1 shines. It is better suited to thinner rugs and hard floors, so if that describes your household then it is one of the best choices out there. To checkout current prices and read online consumer reviews, click here to visit our favorite eCommerce site. They are usually in stock and can be shipped right to your door.